Two graduate students at MIT’s School of Architecture and Planning want to harvest the energy of human movement in urban settings, like commuters in a train station or fans at a concert. 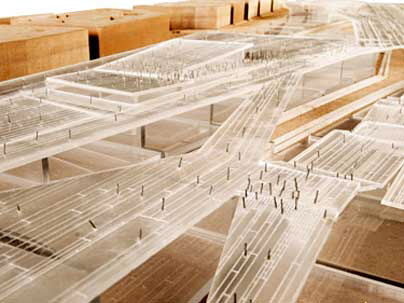 The so-called “Crowd Farm,” as envisioned by James Graham and Thaddeus Jusczyk, both M.Arch candidates, would turn the mechanical energy of people walking or jumping into a source of electricity. Their proposal took first place in the Japan-based Holcim Foundation’s Sustainable Construction competition this year. A Crowd Farm in Boston’s South Station railway terminal would work like this: A responsive sub-flooring system made up of blocks that depress slightly under the force of human steps would be installed beneath the station’s main lobby. The slippage of the blocks against one another as people walked would generate power through the principle of the dynamo, a device that converts the energy of motion into that of an electric current. The electric current generated by the Crowd Farm could then be used for educational purposes, such as lighting up a sign about energy. “We want people to understand the direct relationship between their movement and the energy produced,” says Jusczyk. The Crowd Farm is not intended for home use. According to Graham and Jusczyk, a single human step can only power two 60W light bulbs for one flickering second. But get a crowd in motion, multiply that single step by 28,527 steps, for example, and the result is enough energy to power a moving train for one second. And while the farm is an urban vision, the dynamo-floor principle can also be applied to capturing energy at places like rock concerts, too. “Greater movement of people could make the music louder,” suggests Jusczyk.